Sleep is the holy grail of motherhood. It is the one thing that moms search for from the moment that their little bundles of sleep-stealing joy arrive. We want it even more than chocolate, quiet, or losing that baby weight. SLEEP! Am I right?! It was in search of uninterrupted sleep, eating without having to tell someone numerous times not to pick their nose (and eat it), and getting some quality me time, that I asked Chad for a night away for my birthday present last month. He was awesome and gladly obliged (he definitely gets the ‘Best Husband’ award!). My night away was set for a few weeks later. A ‘Mom’s Night Out’ can be had anywhere, but here in Phuket, Thailand it may be a little different. For example, currently the (decrepit and slightly gross) Motel 6 in Santa Rosa, California is about $76.00, or 2700 baht per night. Here in Phuket, you can stay in a 4-star hotel like the Burasari Phuket for a few dollars less a night. The accommodations here are amazing and much cheaper than many other places in the world. So there are more options for budget-oriented moms. 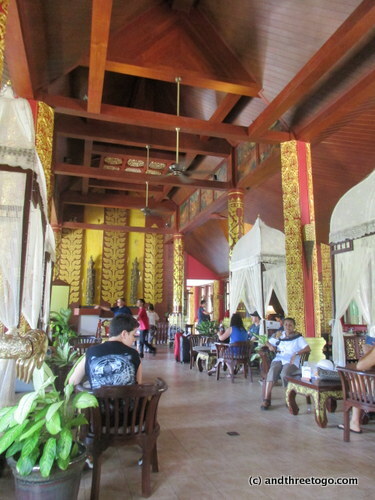 However, I did not stay in the Burasari Phuket resort, it was a little more than I wanted to spend. 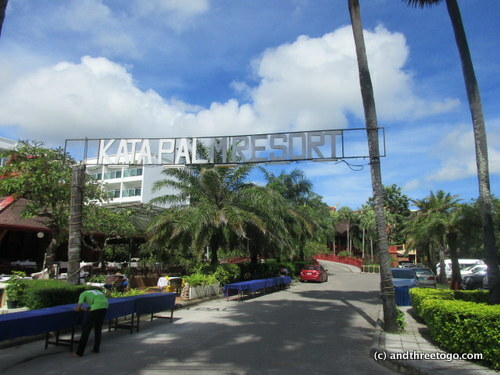 I ended up choosing a less expensive, more centrally located resort called the Kata Palm Resort and Spa. I paid $50 US (1700 baht) for one night. I chose Kata Palm because it was within walking distance to a few different spa’s, about 500 meters from Kata beach, and had a FREE BREAKFAST, which if you have been reading my posts for a while, you will know that free food is always the way to my heart. My Moms Night Out Begins…. Chad dropped me off at Kata Palm Resort around 1:45 p.m., I was unaware that the check-in time was 2:00 pm (seriously when did check-in times get so late in the day?!). I sat in the beautiful reception area and was served tea and a WiFi password while the lovely front desk clerks verified my reservation and registered me. And so it begins! My Moms Night Out! About five minutes later, one of the clerks informed me that my room was not yet ready and could I wait just another 15 minutes. Instead of waiting, I took my opportunity for some immediate pampering! I told her I would be back in an hour and checked my backpack with the bell boy. I was off to find a spa! Inexpensive spa treatments are another way that Phuket (and Thailand in general) is better than many other places in the world to have a ‘Moms night out’. In Phuket, one can get an hour massage for around 400-500 baht for an hour ($11-$15 USD), a pedicure for around 350 baht ($10 USD), along with pretty much anything else one could think of. Many salons even offer temporary false eyelashes and tattooed makeup (nope, I would never do this!). A mom can really get pampered on the cheap! I walked a bit down the road, along the way being asked if I wanted to buy a suit numerous times, almost as many times as I was asked if I needed a taxi. Side Note: A great phrase that everyone should know if visiting or living in Thailand is, ‘Mai Ao Ka/Krop’. This means ‘I don’t want’. As soon as sales people/taxi drivers hear you use this phrase, they usually won’t push it any further. I passed a few massage places and salons, but none of them drew me. I wasn’t looking for a 5-star spa, but I was looking for one that looked clean and organized. 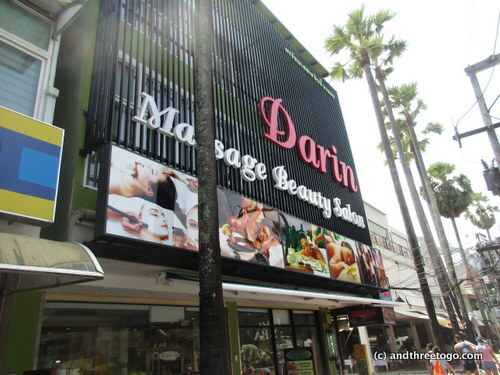 I found it a couple of blocks down, the Darin Massage and Beauty Salon. It was three or four stories tall and was set up with pedicure massage chairs ready for the taking! I walked in and handed my nasty old feet over for a much-needed pedicure. I feel bad that anyone has to touch these. The only problem was that the power was out! So they could not use the jet’s in the pedicure chair. Regardless it was a fabulously and professionally done pedicure and I decided that I would come back to Darin’s for my massage the next day. After my toes were looking fabulous, I walked back to Kata Palm to check into my room. As I walked up to the front desk they recognized me, handed me my backpack and one of the bell-boys showed me to my room. WOWOWOWOWOW! What a room it was! Instead of telling you about it, I have made a slide show for you, so that you can see it. It was so worth the $50 a night (and then some!). I settled into my room and did my Thai class homework for a bit. Then I put on my swimsuit, grabbed my book and headed down to the pool. By the time I was at the pool, it was already almost 4 p.m., so there was only a little sun left. Well, enough sun to read a couple of chapters in ‘The Portrait of a Lady’ by Henry James while enjoying a couple of whiskey sodas with lime. It was so relaxing! As the sun was getting lower and lower behind the resort buildings, I began to get a bit chilled sitting out in my bikini (yep I am completely acclimated to the Phuket climate) and so I trundled up to my room and took a long shower. The shower had one of those rain shower heads. It was so damn enjoyable taking it without being called from another room every five minutes. This ‘Moms Night Out’ was turning out to be absolutely amazing! My goodness, I am getting wordy while I am healing from my other nights away, I am going to continue this next week! Do you totally hate me for making you wait for the rest of my night away? I hope not, because I want you back! Now it’s your turn! If you could have one night away, what would you do? Do you get nights away? Regularly? Leave me a comment and let’s chat! If you really love me and want to get to know me even more, follow me on Facebook, Instagram, Pinterest, and Twitter! If you have a few seconds and can quickly give us a vote, please click the banner below and wait for the page to load! Oh wow, that looks amazing! One day I would like to do something similar. Glad you got to get pampered. Not many nights out for mama here. Those prices there are amazing! And you just pick a spa like I pick a restaurant in a big city because there are so many! Your room was so beautiful! (I was only interrupted 4 times reading this.). Looking forward to the rest! Right! At least there weren’t little hands trying to type! Have a great week! Happy Monday! I wouldn’t know what to do with myself for an entire night out. I am thankful when I can run to the local grocery store alone! I do sometimes get to go shopping with my friends, but the kids are always along for the ride. But they help me with the kids. Sounds like you have awesome friends! 🙂 Thanks for reading and commenting! Ooooh, this sounds amazing! You could’ve ended the story there, and that would’ve been enough. Looking forward to seeing how awesome your free breakfast was (because that and the pool is what staying at a hotel is all about for me, too 🙂 ). Well, at those prices, you probably could ;). You totally deserve this and that hotel looks amazing. I mean, the service in Thailand is exceptional. I only wish I could have a pedicure every day. And a massage. And cocktails while I read. And…. It would be the making of me! My husband just like Chad, is fantastic. He’s German and very chilled so I do get some time out. Every now and then, my girlfriends’ and I have a girls-only-night. I also sometimes get an afternoon to do whatever, so I usually go to the cinema or go to the museum. By myself! And then once a year, I get a weekend to go wherever, without my husband and son, so I went to Amsterdam. And wrote about it LOL! Victoria@ The British Berliner recently posted…The secret of eating & drinking in Warsaw – How to make pierorgi and eat it! Oh man! I would love to be able to travel somewhere new for my night away… I think I will have to add that to my criteria for next time! Thanks Victoria! Wow this sounded amazing! Glad you got some me time! And how affordable it is there! If I lived out there I’d probably hit up the spa every week lol!